Modern lighting can serve a multitude of purposes in the workplace and at home. Your outdoor lights in San Jose may boost your curb appeal and enhance the aesthetic value of your home. They may also serve practical functions and keep your family safe at night. If you are considering installing new lighting on your property, keep reading to take a look at some of the benefits of outdoor lighting. If you are proud of the way your property looks, why stop enjoying it after sundown? Outdoor lighting allows you to enjoy the view from your back porch all night long, and it can be used to accentuate some of the most important features of your yard. You can use outdoor lighting in countless different ways; the more creative you are, the more options you will have to work with. In addition to illuminating focal points throughout the exterior of your home, outdoor lighting can also direct attention towards your house itself. This allows you to point out interesting or pleasant architectural features throughout the night. Even your neighbors will benefit from your outdoor lighting while they soak up the view as they walk by. There is nothing quite like a backyard game of badminton or soccer with the family on a warm summer day. If you live on a property with insufficient outdoor lighting, you will have to enjoy this exercise and bonding time during a certain window of opportunity. If you do have adequate outdoor lighting, on the other hand, you can simply take a break to watch the sunset and resume play during the night. Outdoor lighting can also facilitate nighttime dips in the pool, and it can even keep you safe while doing so. 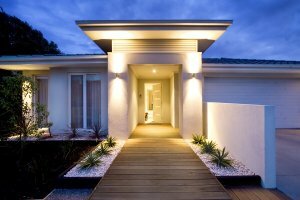 Your exterior stairs and walkways are much easier to navigate with outdoor lighting. Your home will also be much better protected from potential criminal acts such as vandalism and burglary. Outdoor lighting reduces the amount of hiding spots that criminals may find on your property, which will typically deter them from attempting to break in. Lighting in San Jose is one of the most important aspects of the home; it allows you to focus on specific tasks, enjoy a nice atmosphere, and in some cases, even save on energy bills. It is helpful to plan your home lighting thoroughly, and plan it before you even move in to your new house. Watch this video clip for a few helpful tips on creating a lighting design for your home. In order to plan out the optimal lighting design for your home, it is crucial that you consider the activity that will occur in each room of the house. You may need task lighting for your home office so that you can get your work done, or you may want ambient lighting for your home entertainment center. The way you use each room should dictate its lighting design. Use a dimmer on every light for maximum versatility.